Open up your brain to possibilities by asking yourself, “What would have to happen for [future result] to come true?” Don’t discount any ideas to start, just bask in their potential. Move from daydreaming to action by walking an idea back to the next immediate step to take. Before the new account, there’s a presentation, there’s an agreement on outcomes, there’s a discussion of shared beliefs. . .all the way back to having their phone number. Start there for now. Look up their phone number. Most of your people want change/future result, they just don’t want to go through the muck to get there. Help them keep their eyes on the future. 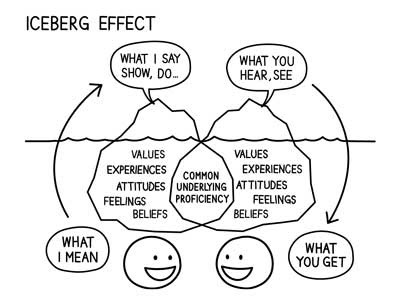 That’s the iceberg effect of communication. Our tools for communication are limited to what we can say, show, and do, but what we mean is full of experiences, feelings and beliefs. Depending on who we’re communicating with and how much we have in common, a nodding head and a “yes, okay” may or may not signal agreement. Add in a foreign language and the complexity multiplies. However it’s not limited to foreign languages. Consider this exchange I had with a friend from Down Under who is working through some challenges. Him: I’m going through some challenges. Me: I’m sorry to hear that. (then trying to sound Australian) I’m pulling for you, mate. Him: (laughing uncontrollably) I appreciate it. In Australia “pulling” is slang for masturbation, so don’t go overboard! Interesting. . .I couldn’t help but notice. . . This week I sent my annual update to almost everyone on my contact list. (except my mother in law. . .she marked my last one as spam and new ones won’t go through. . .I’ve tried) This year I decided to mix things up and added a video letter. I spent an inordinate amount of time setting up the shoot. I recovered a child’s old iphone to use as the camera. Found the perfect sized tripod to hold the camera at just the right angle. Set the recording levels and then poured my heart into bringing my stories to life and being somewhat interesting. I tossed in some edits, added some graphics to spice things up, sat back and sighed. Satisfied with my result. The first response came in 12 minutes after I clicked send. It started with a compliment about my speaking and then asked about the important stuff. Like who exactly is that a photo of on the shelf behind my desk.